How do you find the common ratio of a Geometric Sequence? How can we check whether the sequence is Geometric Sequence or not? Geometric Progression is the sequence of numbers such that the next term of the sequence comes by multiplying or dividing the preceding number with the constant (non-zero) number. And that constant number is called the Common Ratio. It is also known as Geometric Sequence. The first term of the sequence is called the Initial Term or the scale factor which is denoted as ‘a’. The ratio of a term to its next term of the sequence is called the Common Ratio, which is denoted by‘r’. Let’s check the value of the 4th term using the nth term formula. The geometric progression with a limited number of terms is called Finite Sequence. It has a last term. The geometric progression with unlimited number of terms is called Infinite Sequence. It does not have a last term. The common ratio is the ratio of the term of the geometric sequence to its previous term. And it is denoted by “r”. Sometimes we need to calculate the common ratio of the sequence. So to find the common ratio, we need to take the ratio of the terms with their preceding term. Hence the common ratio is 2. 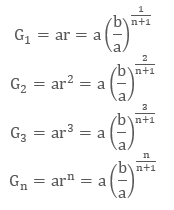 If we need to check whether the sequence is geometric sequence or not, we can use the formula of common ratio for this. Check whether the sequence is geometric sequence or not? Let’s find the common ratio of the given sequence. Here the ratio of all the terms with their preceding term is not constant, so this is not a geometric sequence. Here the ratio of all the terms with their preceding term is constant that is, 3, so this is a geometric sequence. It depends upon the value of the common ratio that the geometric progression is increasing or decreasing. If the common ratio ‘r’ is positive then the geometric progression will be of same sign as the first term of the sequence that is, positive. If the common ratio ‘r’ is negative then the geometric progression will be of same sign as the first term of the sequence that is, negative. If the common ratio ‘r’ is greater than 1, then the geometric progression will be in the exponential growth towards positive infinity. 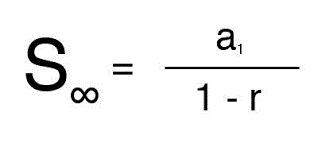 If the common ratio ‘r’ is less than -1, then the geometric progression will be in the exponential growth towards (unsigned) infinity, due to the alternating sign. If the common ratio ‘r’ is between -1 and 1(not zero), then the geometric progression will be exponential decay toward zero. If the common ratio ‘r’ is zero, then the result will remain zero. When we add the terms of the geometric progression then that sum is the geometric series. Like, the GP, the ratio between every consecutive term is always constant. 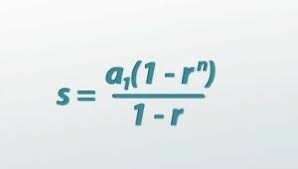 where a is the first term of the series and r is the common ratio. What is the 6th term of the series 2 + 4 + 8 + 16 +…? So we will put the values in the formula of nth term of the series. Here n = 6 as we have to find the 6th term. So the 6th term of the series will be 32. If we have to find the sum of the infinite geometric series then we will use the different formula. Find the geometric mean of 2 and 18. We can use the above formula to calculate the geometric mean. Here we can see that the sequence 2, 6, 18 is a geometric progression. We can calculate the geometric mean of more than two numbers also as for calculating the geometric mean we have to multiply all the numbers and then take the nth root of that number. that is, If we are multiplying two numbers, we are taking the square root, as we had taken in the above example. If we will multiply three numbers then we will take the cube root. Likewise, if we are multiplying n number of terms then we will take the nth root of the number. What is the Geometric Mean of 1, 3, 9, 27 and 81? We can insert two or more numbers between the two given numbers to form a Geometric progression. a, G 1, G 2, G 3,…, G n, b is a G.P. Insert 2 numbers between 1 and 64 such that the resulting sequence is a G.P. the sequence is in G.P. Hence, two numbers between 1 and 64 are 4 and 16 which in turn are making a Geometric sequence.